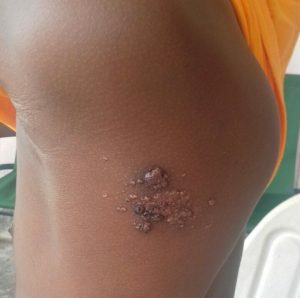 This birthmark on the left shoulder blade bled after the teacher allegedly lashed him. A former Region Five Education Officer (REdo) and Head Teacher of a private school in East Berbice is now in hot water after allegedly trashing a first form student over shared homework. The student, 13-year-old Shazam Khan, relayed to Demerara Waves Online that although that was the first time he sought medical treatment for his injuries, he had allegedly been severely beaten before. Berbice Divisional Police Commander, Assistant Commissioner Lyndon Alves confirmed that police were probing a report of alleged assault by the well-known educator, Basheer Khan. The alleged incident was reported to the Whim Police Station and the child was taken to the Port Mourant Public Hospital for treatment to his injuries. Alves said the file has since been dispatched to the Director of Public Prosecutions for advice. Khan has only been enrolled at the privately-owned Berbice Islamic School at Port Mourant for a year and two months. Berbice Islamic School, Port Mourant. The lad stated that at around 12:30pm on Monday, his friend asked him to assist with the Math homework they were given. Being the norm, the child took out his book and lent the friend. Shortly after the Head Teacher went to the classroom and after observing the child copying the homework, the student alleged that the Head Teacher threw the book out the window. Khan further alleged that the man left the classroom and returned with a ‘bamboo whip’ and inquired about the homework he threw out. “After he throw away the book, I ask he why he do it and he go for he whip and come back and ask me for me homework and I tell seh how you throw away the book with the homework and then asking for it now”. Khan accused the teacher of lashing him about his face and body with the whip in the presence of other students inthe classroom. He also alleged that the head teacher then called him ‘a goat’ for chewing in the class. 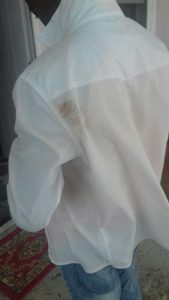 The bloodied shirt as a result of the injury. Khan further stated that after he informed the teacher that he was going home to report the incident to his parents he was allegedly assaulted again by the teacher. “He scramble me by my shirt after he want beat me more and I tell he seh I going and tell my parents”. The lad relayed that he is afraid of the man and was unsure whether he would return to the school. “I can’t believe he beat me like this. We was good all the time and now I frighten to go back school because I think he gonna do me something again”. He further alleged that Monday’s incident marked the fourth time he was beaten by the Head Teacher. “Since I going deh, this is the first he beat me so bad. All them other time, me skin never bleed. and is with the same wild cane he beat me with”. 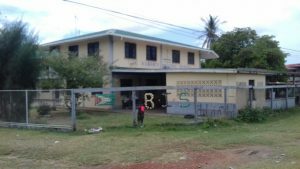 The current Region Six REdo and the head teacher have declined to speak on the issue. Guyana has scrapped corporal punishment in schools, in keeping with international obligations.